刘云, 陈田田, 宋书群, 李才文. 2019. LIU Yun, CHEN Tian-Tian, SONG Shu-Qun, LI Cai-Wen. 2019. Oceanologia et Limnologia Sinica, 50(2): 301-307. LIU Yun, CHEN Tian-Tian, SONG Shu-Qun, LI Cai-Wen. 2019. CONTENT AND COMPOSITION OF FATTY ACID IN PLANKTONIC DINOFLAGELLATE AKASHIWO SANGUINEA CULTURED IN DIFFERENT NITRATE CONCENTRATIONS[J]. Oceanologia et Limnologia Sinica, 50(2): 301-307. Abstract: Batch cultures of the planktonic dinoflagellate Akashiwo sanguinea were conducted in different nitrate concentrations. 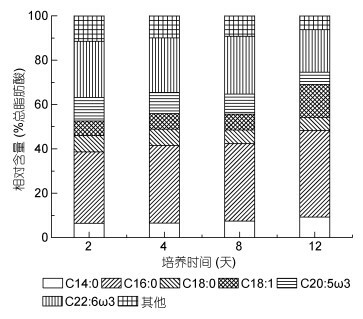 Variations of the fatty acid content and its composition at different growth stages of A. sanguinea were analyzed. 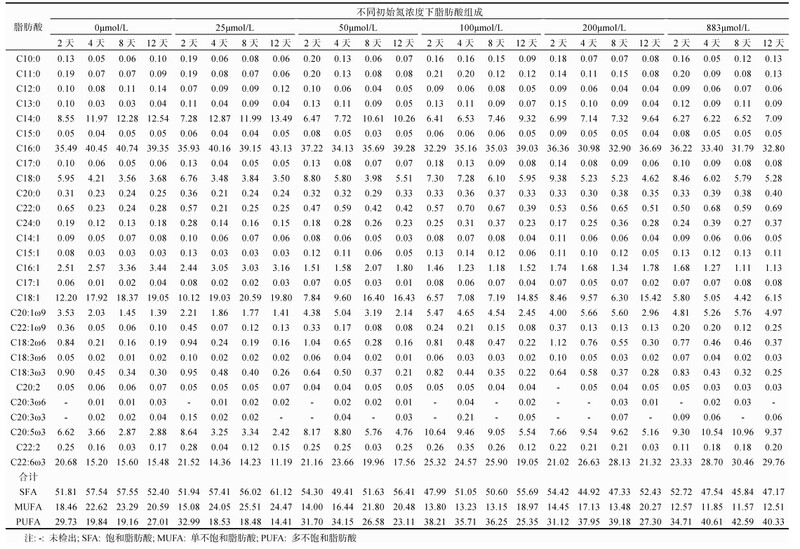 The results indicate that the fatty acid content and composition varied with both N concentration and growth stage. 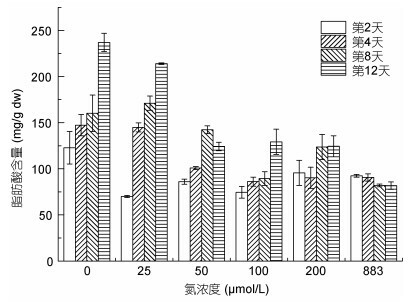 In particular, the fatty acid contents in lower nitrogen concentrations[0-25μmol/L, (150.02±54.84)- (166.83±46.46)mg/g dw] were significantly higher than those in other N treatments (P < 0.05). 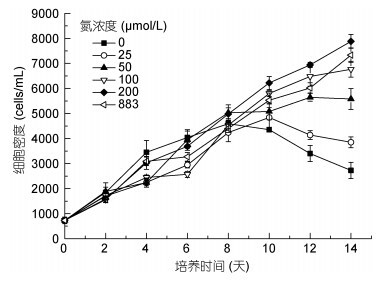 The lowest value (86.70±5.66)mg/g dw was found in the 883μmol/L treatment. The fatty acid content in each treatment increased with the growth of A. sanguinea, reaching the highest in the stationary growth phase and lowest in the early exponential growth phase. 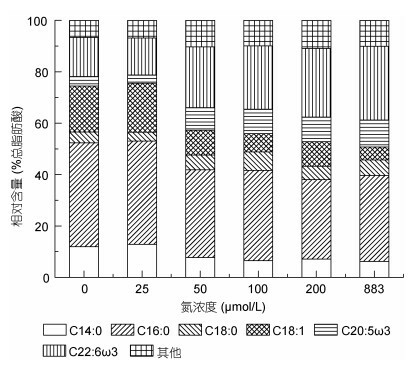 Twenty-eight 28 fatty acids were detected in A. sanguinea, including mainly C16:0, C18:1, C20:5ω3 (EPA), and C22:6ω3 (DHA). The DHA content was relatively higher, with the maximum of 30.46% of total fatty acids. With the increases of initial N addition, the proportions of saturated fatty acid (SFA) and monounsaturated fatty acid (MUFA) declined whereas the polyunsaturated fatty acid (PUFA) increased. In addition, the proportion of MUFA was higher in the stationary phase, while PUFA was higher in the early exponential growth phase. The results help further understanding of the physiological strategy of A. sanguinea adoption to an environmental stress.